Typically, the Likert scala is used for survey items like "Please rate the following elements on a scale from 1 (disagreement) to 5 (agreement)" . Then it presents the elements like "Our company is strong at analytics", "Our company is digitally adept", etc. Likert Charts greatly show the differences between these elements. They help to visually compare multiple survey items at once. Moreover, Likert Charts also allows to simply add further lines, e.g. for "Best in Class" comparisons. Many survey tools provide an Excel export option. This generates a file where all survey results are in one worksheet: The top row contains the survey items, the first column contains a participant identifier (here company name) and maybe some columns with cluster information (e.g. here class, which is about company size). At the intersection between columns and rows the answers can be found: Here values between 1 and 5. As this example is about companies, a personalized feedback slide for each companies shall be created. Thus, a single cell needs to hold the selected company name. This cell must not have a formula. Its contents will be overwritten with company names from SlideFab 2 automatically. These columns allow it to create Likert Charts based on an Excel "Scatter with Straight Lines" chart. An explanation on how to do this can be found here or just look into the example file which can be downloaded below. With the selected company (cf. above) the personalized data can be looked up using VLOOKUP or INDEX/MATCH. When the selected company changes, the output data range will be updated automatically. A table containing the survey items (For the sake of simplicity in this example these items will be hard-coded. Creating a flexible one with looked up survey items one would be possible as well. 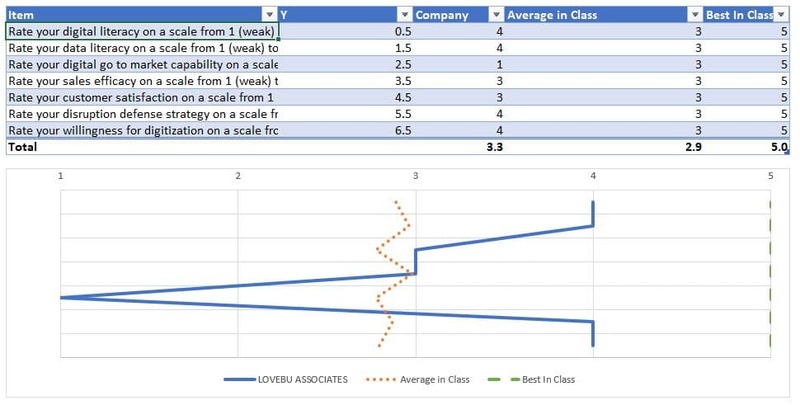 The Likert Chart which is aligned to the table. In this example only two elements will be automated. This means that this example is perfectly suited also for the free SlideFab 2 lite edition. First of all, the chart title will be linked. Therefore the title shape needs to be clicked in Powerpoint. Then the Excel cell with the title needs to be clicked. Finally through clicking the crosshair icon, SlideFab 2 links the cell to the shape. 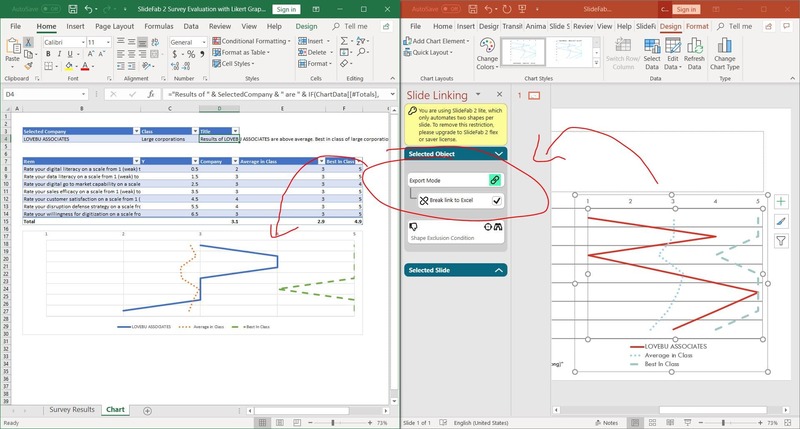 Secondly, linking the chart is even easier: As this chart is an Excel chart copied and pasted as link to Powerpoint nothing has to be done. 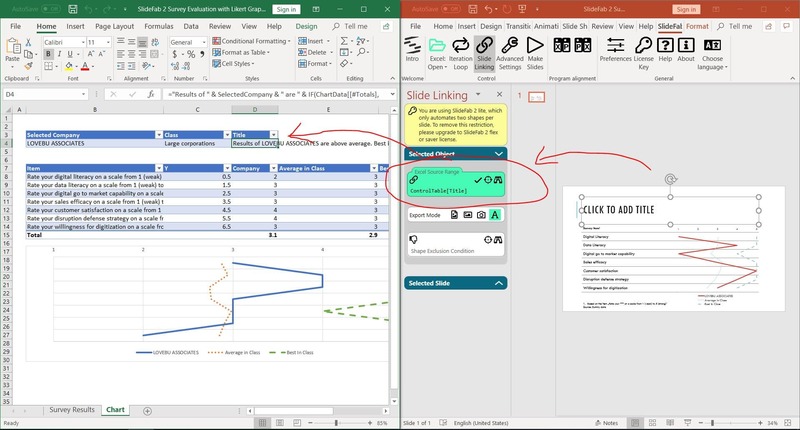 SlideFab 2 will tick the box to break the link to Excel automatically. Otherwise the charts would be updated permanently, whenever the selected company changes. 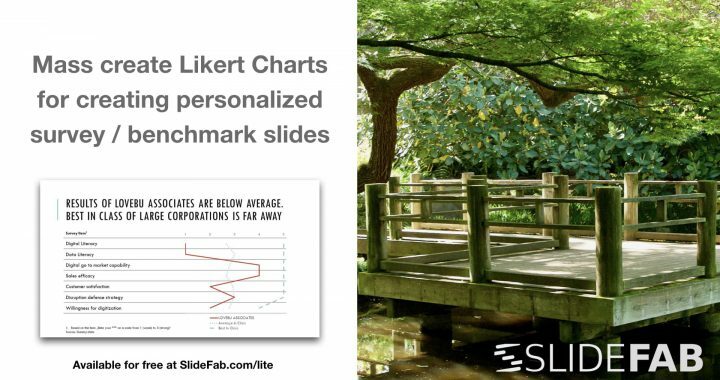 To mass-create personalized copies of the Likert chart SlideFab 2 needs to know how. 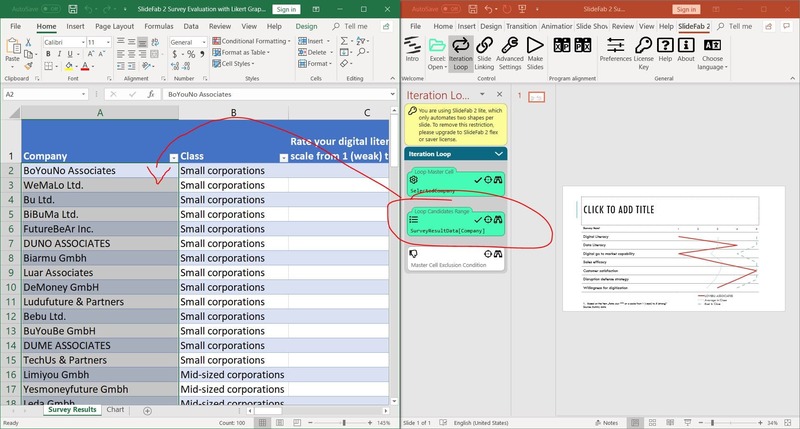 Therefor the "selected company" cell needs to be selected and the crosshair for the "Loop Master Cell" needs to be clicked. Now SlideFab 2 knows that this cell needs to be altered. 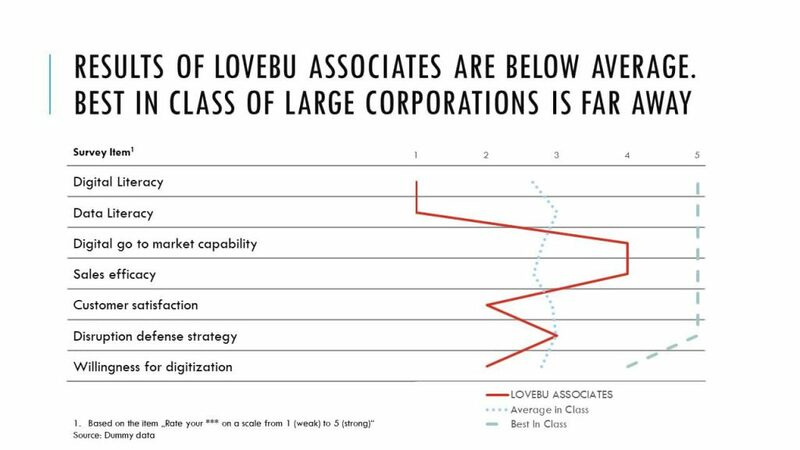 As the chart depends on the "selected company" cell, a personalization will be achieved. To tell SlideFab 2 for whom the personalization needs to be created the "Loop Candidates Range" needs to be filled. Therefor the range with the company names has to be selected and the crosshair needs to be clicked. As everything is set up now, it just necessary to start the SlideFab 2 automation to mass create hundreds of slides with Likert Charts. This example here can be reproduced with the free SlideFab 2 lite edition. 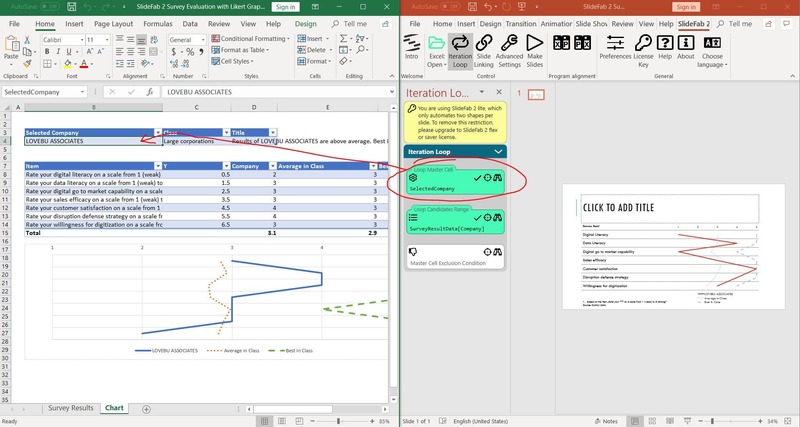 Posted in Example, Tutorial and tagged Excel, Tips.